I’m always interested in how small presses raise money, and this is a subscription model that’s new to me. Foxing Quarterly is offering a limited-edition print series which can be pre-ordered at a reduced rate this week only. The sale ends Tuesday March 25. Foxing Quarterly is literary/arts journal out of Austin, Texas. The publication has a lot of polish, and some significant cartoonists are among their contributors (Jim Rugg, Gabriel Bell, etc.). Check out their website, I’m pretty impressed with how well it’s designed. This will be their second annual print series. The theme is READ and the designs are inspired by vintage children’s library posters. Each print is limited to only 50 editions. 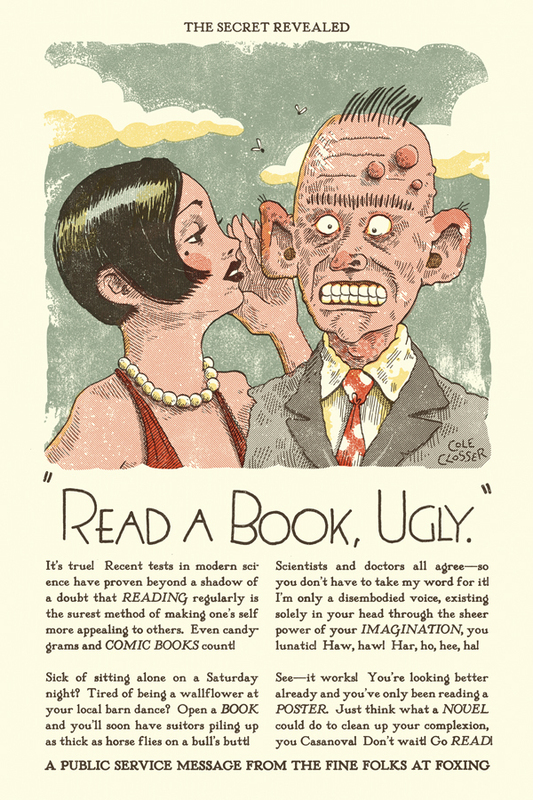 I really like this one by Cole Closser. This entry was posted in Uncategorized and tagged Foxing Quarterly, subscription. Bookmark the permalink.